Stephanie Mango is a senior vice president at CGI Federal, where she leads a team serving the departments of Justice and Homeland Security, the intelligence community and others. 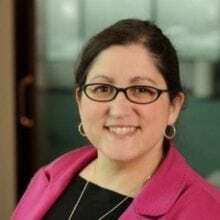 She was named to FCW’s 2016 Fed 100 list in part for her work toward consolidating and modernizing shared services across executive branch agencies. Why watch: Mango, a 23-year CGI veteran, continues her focus on consolidation and modernization of IT services and back-office systems in federal agencies. She leads the team that works with DHS on its Continuous Diagnostics and Mitigation program, a governmentwide shared service responsible for strengthening cybersecurity. Mango and her team also work with a number of agencies to modernize back-office systems with CGI solutions designed specifically for federal customers. Finally, Mango says she’s excited about the company’s launch of a new D.C.-area innovation center, established to foster collaborative design-thinking sessions to develop creative solutions, in partnership with federal agencies to overcome challenges to mission success. Click here to view the rest of the Top 10 Execs To Watch in National Security for the National Capital Region.